Namco Bandai have released a further trailer for the forthcoming return of the celebrated Ridge Racer franchise on Nintendo 3DS, demonstrating the replay mode within the game. Ridge Racer 3D is set to feature high-speed drifting, red hot racing battles and a host of new features, alongside encompassing the breathtaking stereoscopic 3D capabilities of Nintendo’s latest handheld. 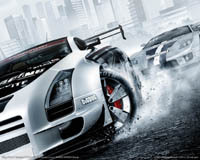 Players will be able to choose from an all-new line up of high-powered muscle machines that will join the existing in-game selection of race-tuned road beasts, and will gameplay will incorporate a new Drift Button that makes it easier than ever to pull off spectacular turns through tight corners without losing position. There’ll also be brand new, vibrant courses to speed along in addition to re-appearances of favourites from previous Ridge Racer titles. Ridge Racer 3D is set to launch alongside the Nintendo 3DS on March 25th across Europe.